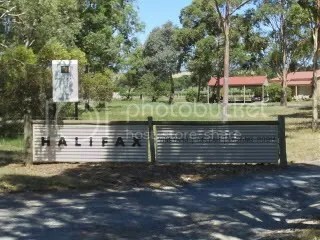 I first encountered Halifax wines at the McLaren Vale’s “Vale Cru” tasting a couple of months ago and was impressed. After my recent visit I am even more impressed. I got onto the mailing list at the Vale Cru tasting and got myself an invite to their yearly new release tasting. Well what an absolute joy – it does not take long to see Peter and Lizzy’s outlook and even the wines show the same. They are passionate about – good food, good wines, good friends, good times. Their pride (after the wines) was a large dining table where we were invited to share a light lunch with other Halifax wine lovers and try their wines in a relaxed food and friend atmosphere. 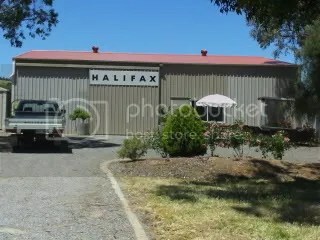 The shiraz vineyard is on Binney Road between the towns of McLaren Vale and Willunga. This south eastern area of the McLaren Vale region and has a higher elevation and slightly cooler than the plains regions of McLaren Vale. Wine made in the vineyard and sustainability are the 2 catch cries from Peter. Peter is committed to minimal interference with the wine – minimal oak influence, no filtration or fining – he lets the vineyard and the fruit do the talking. The shiraz is supplemented with cabernet sauvignon, grenache and soon mourvedre. The winery is not open for cellar door visits – it is purely by appointment only. This grenache based wine is effectively sold out (to restaurants) – and after tasting it I can understand why. A salmon colour followed by an aroma hit that is just like freshly crushed grenache berries. The palate is full of nectarine and apple with an almost creamy finish. This is a lovely dry wine with lots of acid. It is a shame it is all but sold out. If this is representative of the rose to come bring on next vintage with a block of goats cheese and crusty bread. A blend of 70% Grenache, 25% Shiraz and 5% Cabernet Sauvignon. This is a lighter style than the normal McLaren Vale Grenache based wines, and I for one believe there is room for both styles. A juicy infusion of red berries on the front palate and blackberries on the back palate. This is a soft wine – minimal oak and fine grape tannins. Drink this wine now with lasagna (my wife makes the best lasagna). The wine is bright red – a surprise considering it is a bit older than general red wine releases. Quite fragrant with lots of black fruits – particularly black cherries. When I tried this I was taken by how soft this was is – all the usual McLaren Vale shiraz fruits come through – plums and blackberries, all in waves with minimal oak influences. This wine would last a while – but it is so juicy why wait! Have a bottle or three of this with slowly braised lamb shanks and make sure you share this with friends. Two words – silky smooth. The vineyard the grapes came from the vineyard Penfolds Bin 707 came from. The wine is a sensory wave of blackberries and blackcurrant (both on the nose and palate). The oak treatments are not evasive and supply a pleasant dusty tannin finish. Drink it with a big juicy medium rare steak. The wine is for current customers however, for Lonely Grape readers, this museum release shows what the current vintage may evolve into over the coming years. The wine is showing a small amount of browning. The nose is showing the black fruits with savoury characters of chocolate and a mushroom earthyness. Bring on a huge plate of Grilled Field Mushrooms (with vin cotta added to the upturned cups) with ricotta gnocchi covered in a simple butter mushroom sauce at a table full of your friends. 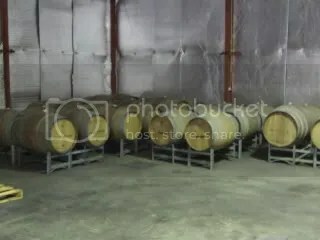 This entry was posted in Mclaren Vale, wine and tagged Cabernet, Grenache, Mclaren Vale, McLaren Vale Wine, Shiraz, Small Producer, wine, wine McLaren Vale. Bookmark the permalink.